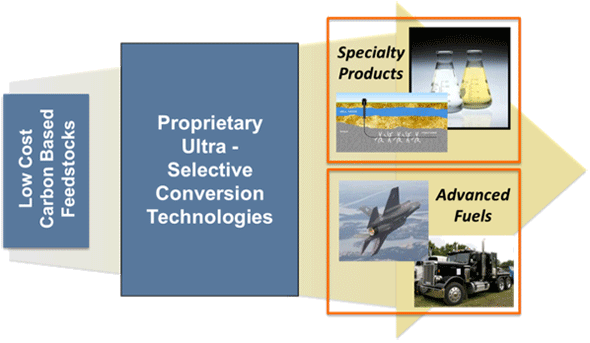 Accelergy deploys industry leading, advanced catalysts and state-of-the-art process technologies to transform natural gas, biomass and/or coal into clean specialty products and transportation fuels. Coupled with our proprietary TerraSync® carbon capture and utilization (CCU) technologies, Accelergy can drastically lower or eliminate the carbon footprint of our products profitably. Our integrated HDX bioconversion processes are more efficient and cost effective than competing alternatives, and able to produce 100% renewable distillate range hydrocarbons with superior properties to current market offerings for Food and USP grade solvents, lubricants and EPA certified low toxicity biodegradable drilling fluids. A new class of products being offered are TerraSol® liquids, high-purity synthetic mixtures of hydrocarbon and oxygenate based liquids produced using our HDX manufacturing processes.